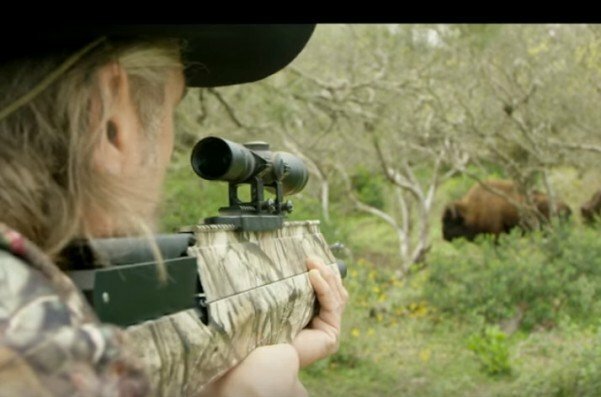 The company that filled our childhoods with BB and pellet guns just might have found the middle ground between bow hunters and rifle hunters. The Pioneer Airbow, manufactured by Crosman, is creating some buzz in the hunting world for it’s scope-sighted, rifle-style weapon that delivers a full-sized arrow with 450 feet per second of velocity. It’s being called a great success, but not all states have signed on to allow its use. The airbow is an all-new category of big game weapon. According to Crosman, the weapon can be cocked with just two fingers, and can fire eight shots in the same amount of time it takes to fire three from a crossbow. But whether this counts as actual bow hunting is up to the beholder. Of course, bow hunters are purists. They like to talk about the skill and stealth they employ to take their game. And rifle hunters of course enjoy their firepower and accuracy, driven by the likes of Luepold for sight optics. The argument for the new weapon is that it enhances everything bow hunters enjoy about archery hunting, but makes the sport safer and more accessible. Also, apparently the arrows from the airbow stabilize quickly, which advocates say gives shooters an expanded kill range for any game animal. They say the weapon’s accuracy is not affected by canting and it does not require the complex maintenance of crossbows. It’s powerful enough to drop a bison, by the way. The airbow comes with a Benjamin air tank that holds 3,000 psi of compressed air. And it comes with a hand pump for field refills. The weapon is also wrapped with Realtree cammo. It seems like the perfect hybrid weapon, but it has yet to gain acceptance as a legal weapon for a variety of game. If you’re hunting coyote and predators, you can use the airbow in 22 states. Other game, such as mountain lions and deer, are much more restricted, however. So while the airbow could be a game changer, the legality may take a while to catch up.